More than a year ago, I participated in a Saturday Night Genealogy Fun blog post where I listed all 16 of my second great-grandparents. See Heritage Pie Chart for the basic details - names, dates, locations and parents of this generation of my ancestors. I have blogged about 15 of these 16 second great-grandparents. The 16th of these ancestors I want to write about is Mary Elizabeth Gorin (1833 - 1891). I have written about her husband, Daniel Morgan Ashby, and shared an ambrotype of her father, Thomas Jefferson Gorin. Much of what I know about Mary Elizabeth Gorin is found in the Gorin Family Bible that was passed down in the family and is now in my possession. She was born on June 28, 1833, in Glasgow, Barren County, Kentucky, where Gorins had been for several decades. Based on the bible entries, Mary E. Gorin was the oldest of seven children born to her parents, Thomas Jefferson Gorin and Mary Ann (Bowman) Gorin. According to U.S. Census records and city directories, she spent just about all of her life in Glasgow, except for her last few years, when she lived in Louisville, Kentucky. In 1850, the first U.S. Federal census that lists the names of all household members, she is enumerated in her parents' household as 17-year-old Mary E. Gorin. According to the family bible, Mary Elizabeth Gorin married D. M. Ashby on February 11, 1857. 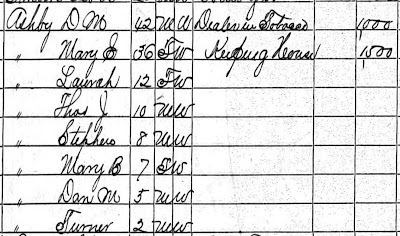 Mary E. Ashby's occupation is H.K. (presumably Housekeeping). She is mother already to two children: Laura Ashby, age 3, and Thomas J. Ashby, age 8/12. Husband D. M. was a 42-year-old Dealer in Tobacco with a $1,000 value of personal estate. Mary E. Ashby, at 36 years old had a value of $1,500 in personal estate. This is one of the census records I used to determine that my great grandmother, Mary B[owman] Ashby was born in 1863, not 1866, as claimed on her death certificate. See My Kentucky Great Grandmother for those details. 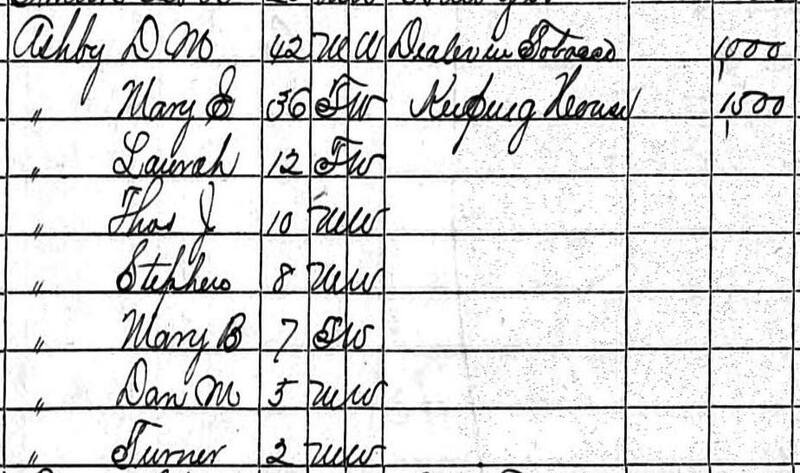 In the 1880 Census, Mary E. Ashby and her husband, Daniel Morgan Ashby are living with five of their children. The eldest, Laura, had married Junius J. Smith and was enumerated with him in Chicago, Illinois. Junius Smith was also originally from Glasgow, and I wish I knew what drew them to Chicago. Mary B. Ashby is my great grandmother, and is "At School." Her older brother, Stephen, is "At Naval Academy." Another older brother, Thos. Jefferson Ashby, is a Cattle Dealer. The two youngest brothers, D. Morgan, Jr. and Turner, are also "At School." Based on what I found for her husband, D. M. Ashby in Louisville, Kentucky, City Directories, they moved from Glasgow to Louisville by 1887. Mary Elizabeth (Gorin) Ashby died in 1891 in Chicago, while visiting her daughter, Mary. See her death notice.